Around this time each year, Universal Orlando partners with Burger King to offer discounted admission to the popular Halloween Horror Nights event. And in promotion of these promotions, Burger King posts ads on their Florida restaurants usually featuring the icon and theme of the year. 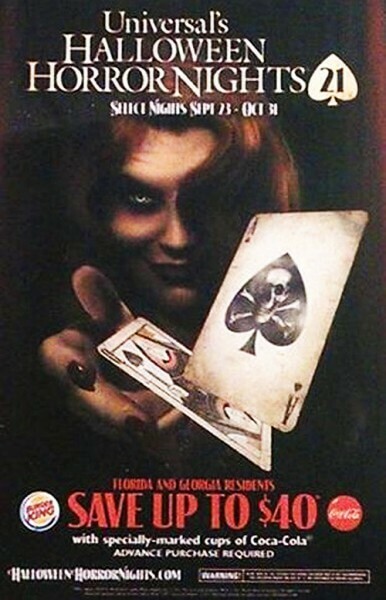 For Halloween Horror Nights 21, the theme of chance have materialized in the forms of cards, both on the web site and in teaser mailings, often referencing Luck with a capital L. Now it appears the rumored “Lady Luck” has presented herself earlier than expected, with one Burger King restaurant posting a promotional ad a bit earlier than Universal may have anticipated. August 31 is the date that Universal has set for the full reveal of details for Halloween Horror Nights 2011, including its haunted houses, scare zones, shows, and overall theme. So does the image above represent the face of this year’s event? Is it truly Lady Luck? Or is this just one of many new faces visitors to the nation’s premiere Halloween event will see? Even if this is an early look at a new character for Halloween Horror Nights 21, there’s still much to be found in the cards as one face never tells the whole story. Check back on Wednesday to find out more.